Today is my cousin Jacques Demêtre’s 92nd birthday! 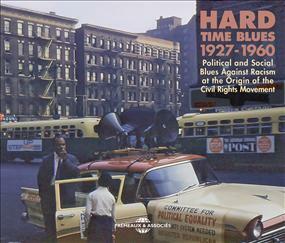 Let’s celebrate with his new CD, a collection of 48 songs called “Hard Time Blues: 1927-1960”. Happy Birthday Jacques! Bon anniversaire! Je t’aime! Jacques Demêtre is a blues historian in Paris and loves the blues – am thrilled to share his newest 2-CD collection, recently released in France on the Fremeaux label. For this release, Jacques selected the songs (some from his own collection of vintage 78 records) & wrote extensive liner notes (both in French and English) with Jean Buzelin. A must for your blues collection! Have a listen, and let us know what you think! I’ll relay your comments & feedback to Jacques. I know he’d love to hear from you. Keepin the blues alive!